One of the biggest ways conservation organizations protect species is by raising awareness. The general public really could care less to protect something they know nothing about. Every year, countless brochures, videos, and other forms of media are created for outreach programs for a particular endangered species. 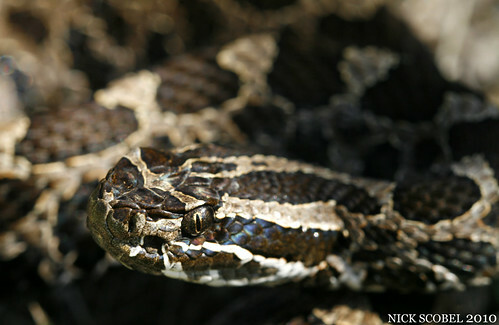 The problem being an imperiled rattlesnake is that, well it's a rattlesnake. 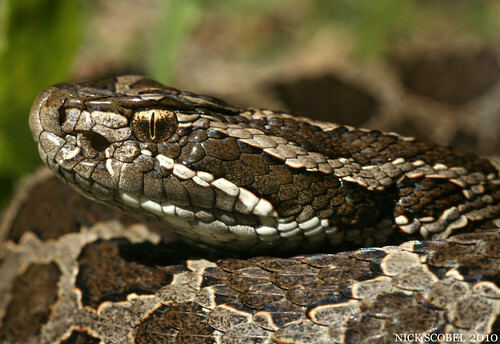 To many rural residents of the Wolverine state, the only good snake is a dead snake. 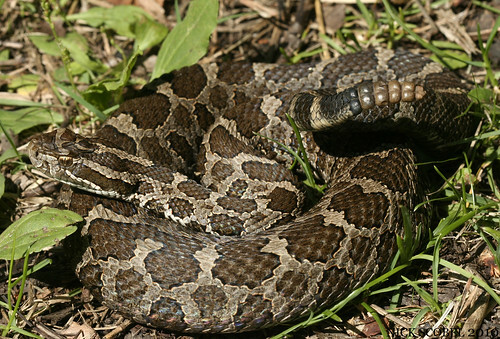 And even though the Eastern Massasauga is an extremely shy species, people in rural Washtenaw & Oakland counties want nothing to do with them and would just as soon kill them. 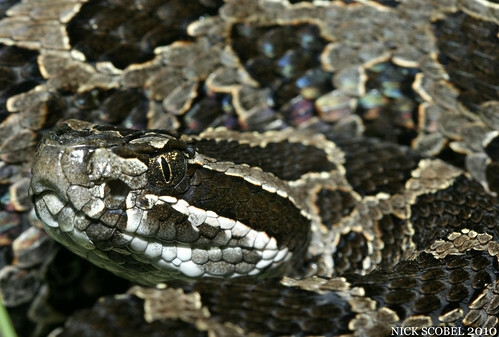 So, how do you educate the public about a rattlesnake that can be locally common not far from human habitation? Well, some county and state parks have taken a few steps in order to try and raise awareness. 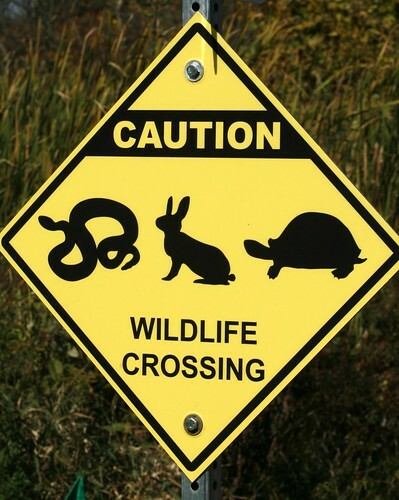 Road signs such as these two at two popular parks are a perfect example of raising awareness for the well being of the species. 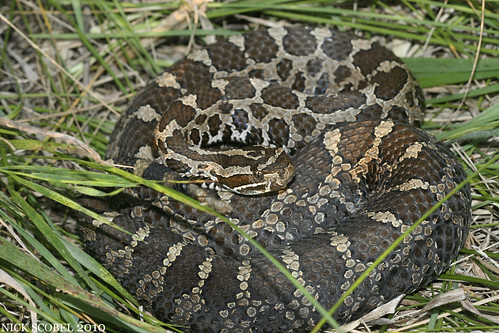 Both parks have roadways which cut through appropriate rattlesnake habitat and often these rattlesnakes are found smashed on the roadways, even when the speed limit is 25 mph. Although signs such as these do not eliminate road mortality completely, they at least alert motorists to be mindful when driving in the parks so that sights like this are avoided. 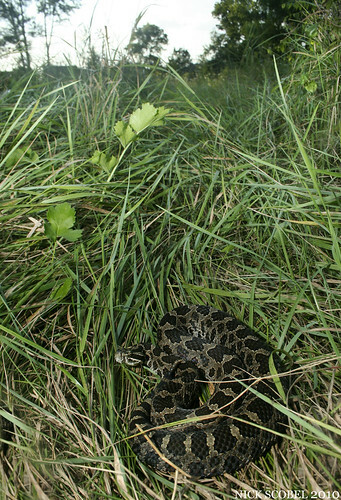 This young Eastern Massasauga was still writhing when I drove up on it and had been obviously hit shortly before. It twitched for a few minutes and eventually died. 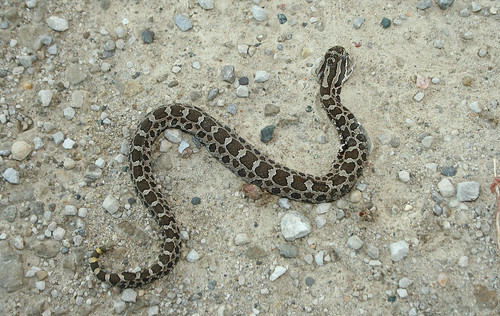 I hate seeing any snake dead on the road, much less this species on a driveway to a nature preserve. 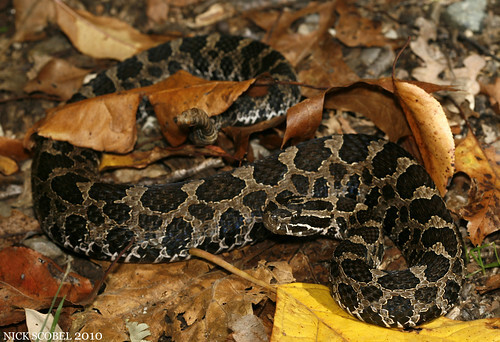 Many of the trails at such parks and nature preserves cut through appropriate habitat where rattlesnakes are found. 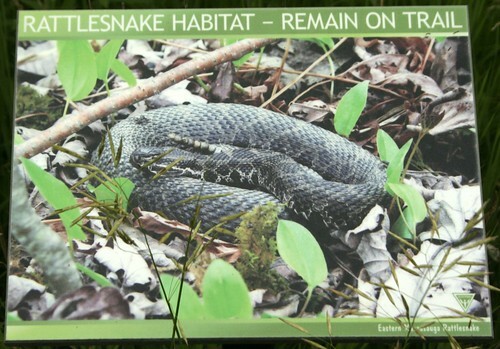 Some parks have taken the liberty to warn guests that they are passing through rattlesnake habitat and are required to stay on trails. 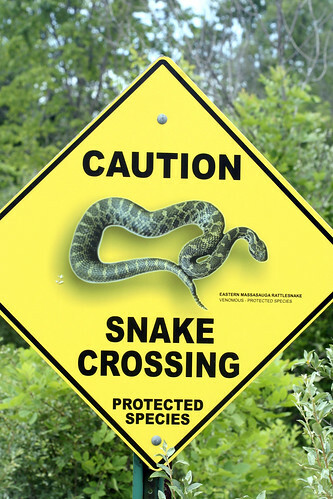 This protects the snakes, the people, and the habitat the snakes inhabit. 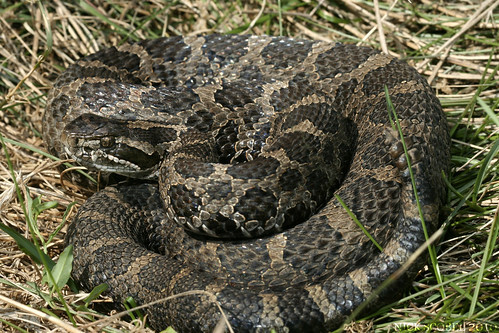 In some cases though, people don't need to go wandering through waist high grass and sedges in order to have an encounter with a rattlesnake. This beautiful individual was sunning itself right in the middle of the trail at a preserve in southeast Michigan in late July. Later during the outing on the same morning, this monstrous adult male was found basking just off the edge of a trail on a grassy hillside in the morning sun. I've seen this particular snake few years in a row and he is well within the 30" range and always puts on a great show. As I mentioned earlier, most parks and preserves encourage visitors to stay on trails for their own safety and in order to protect vegetation and other wildlife. But on state land, there's nothing wrong with doing a little free roaming through appropriate habitat to look for snakes. On another particular evening in late July, my cousin and I ventured to a grassland which is adjacent to a tamarack swamp in hopes of bumping into a few snakes. We ended up running in to two individual snakes, a large gravid female and a freshly shed male. As the summer turns to fall, my field time becomes much more limited as school takes over. But every now and then there's time to get out and do a bit of poking around. One a unseasonably warm October weekend, I met up with good friends Chris and Colin one morning at one of our favorite spots to have a look around. Before Chris and Colin arrived, I noticed a dark stick in the middle of trail which turned out to be much more than a broken branch. 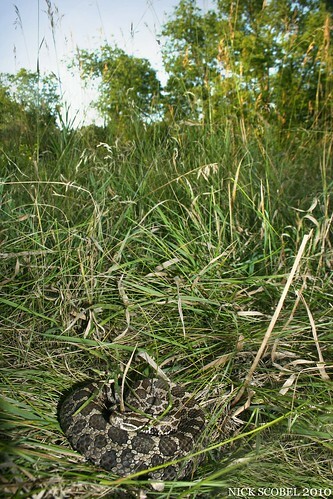 This adult female was calmly making her way across the trail towards a tamarack swamp area and was extremely sluggish. She is a snake that I had seen several times over the summer and she was obviously thin which indicated she has been gravid in the summer and dropped a clutch of babies. She was obviously a freshly shed snake as well, as indicated by her bold coloring. 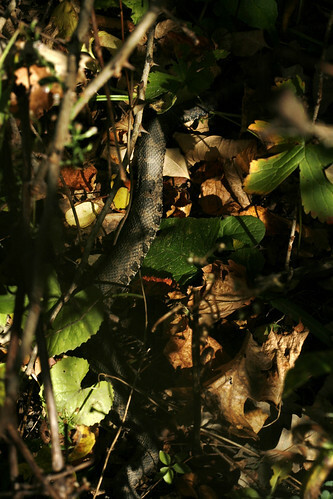 As the morning progressed, more rattlesnakes made appearances on this unusually warm October day. We noticed two rattlesnakes that were basking side my side only a few feet apart. 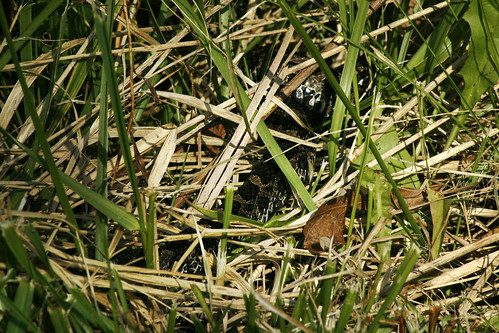 We snapped a few photos and then both of the snakes proceeded to dart down burrows that were right next to them, indicated these snakes were at their hibernation sites. More than a month later, temps again soared in early Novemeber. So I decided to meet up with my friend Chris at one of our favorite sites to see if any snakes were out. Temperatures were in the low 60s and the string of days before had been around the same temperature. We walked a lot of trails and habitat and eventually we were fortunate enough to stumble across a lone rattlesake basking in the late afternoon. So once again another field reason rolls to a close and I'll have to wait til April of next year before these awesome little rattlesnakes emerge once again. Until then, stay warm! 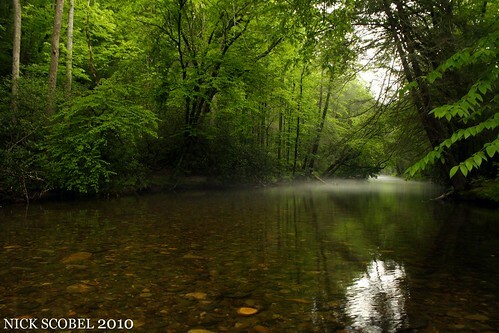 The Smoky Mountains are one of the most beautiful stretches of the Appalachian Mountains. It's one of the few areas in the eastern hills that is a perfect example of what an untouched landscape would've looked like in Tennessee when the settlers arrived. 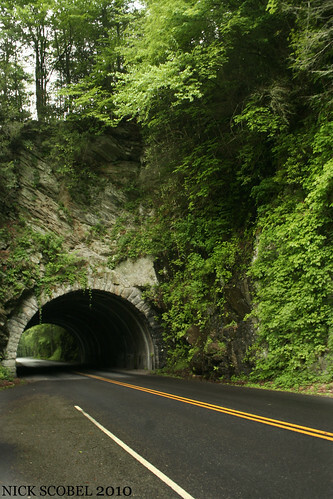 This appeal is what makes the Smokies the most visited national park in the country, with 9 million visitors annually. In May, I had the chance to venture to the Smokies and Blue Ridge Mountains with my sister and good friend Brian for a few days. Although I would be looking for herps, it was mainly to escape and have a stress free trip to an area I hadn't been to since I was 12. We arrived late at night ti the National Park following a large thunderstorm and settled in around two in the morning. The next day we headed out early to hike some of the nearby trails which lead to scenic vistas and waterfalls in the national park. 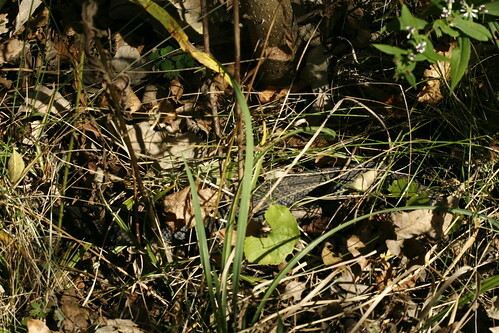 I decided to head off trail a bit and check a nice steep hillside that looked good for snakes, I was elated when I walked across this guy laying out in the sun. I was hoping that we would stumble across one of the two vipers in the area during the trip, and it turned out this snake was the only live one we would see, although several DORs were found. 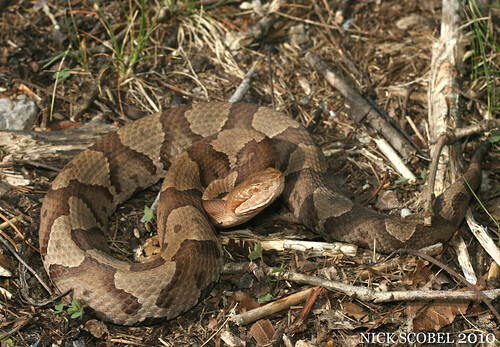 Because I live so far north, it's not too often that I get to encounter Copperheads in the wild and I'm always ecstatic when I do. 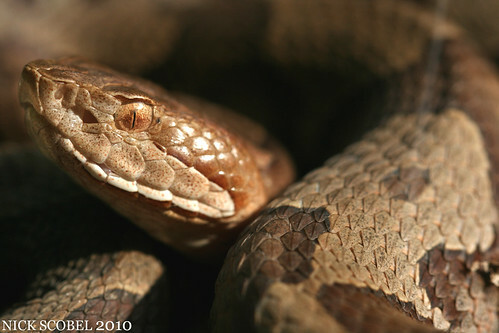 They're one of my favorite snake species and in my opinion one of the most beautiful snakes in North America. The trail we were hiking continued to ascend upward, often winding along edges of the ridgelines. It was beautiful country we were hiking through, and my eyes were always scanning for appropriate salamander habitat, or even bears. 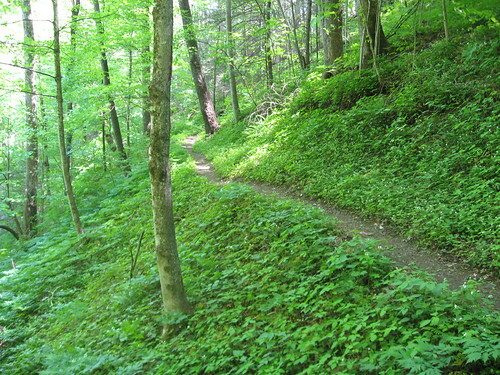 Every now and then along one of the switchbacks, there would be a seepage or small stream crossing the trail. We came across one particular spot that looked promising. I flipped a few rocks in the stream and came up with this salamander. This is one of many Desmognathines that inhabit the Smoky Mountains & adjacent Blue Ridge Mountains. The sheer number of species makes it very difficult to distinguish between some species as they all can look quiet similar and sometimes even hybridize with one another. 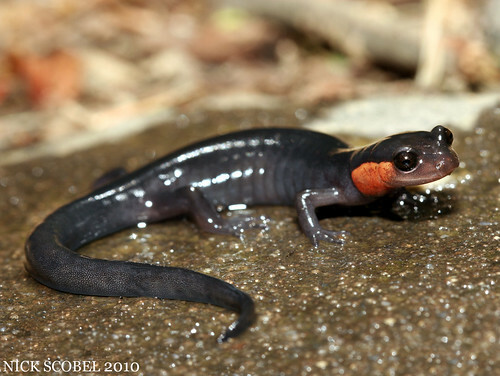 It is often confused with the Black-bellied Salamander which also occurs commonly throughout the National Park, but is distinguishable if looked at carefully and also what type of stream they occur in. 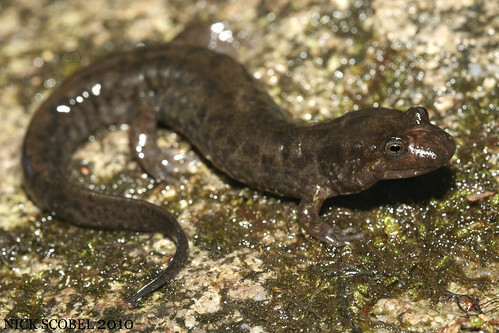 Shovel-nosed Salamanders are more common in second & third order streams at lower elevations in the National Park while Black-bellied Salamanders can be found more commonly in first and second order streams. We continued on our hike and ascended higher and higher on our way to one of the more popular waterfalls in the park. I noticed a large flat rock just off the edge of the trail and decided to flip it. 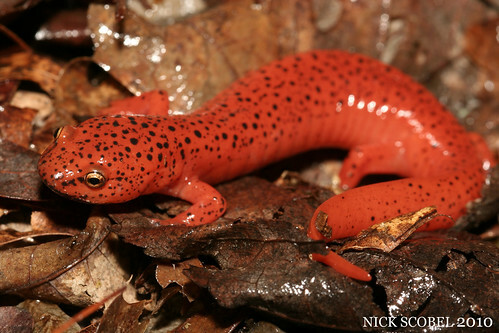 I was instantly greeted with two salamanders of the same species that I had been hoping to see on the trip, their bright reddish-orange cheeks were a delight to see. 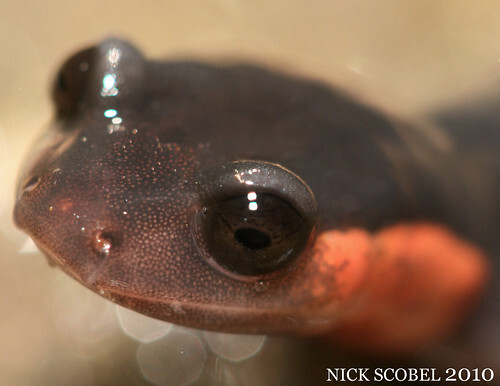 This handsome Plethodontid is one of the more recognizeable species that inhabits the Smokies. 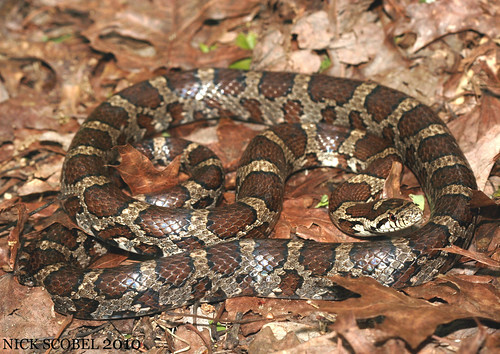 It is a high elevation species, and the Red-cheeked variant only occurs within the Great Smoky Mountain National Park. They are a terrestrial woodland species that often is found under logs, rocks, and other cover at high elevations and can be seen wandering at night along the forest floor. I was happy to come across them on our trip because I was worried we couldn't come across due to construction at Clingman's Dome, a popular haven for this species. We pushed forward once more and eventually came to Grotto Falls, a popular waterfall in the park. I searched around the perifery and flipped up another salamander species right at the edge of the pool the waterfall was thundering into. This large Desmognathine is one of the largest members of this genus, and is common throughout the National Park. As stated earlier, they are difficult to distinguish from Shovel-nosed Salamanders, but with a good field guide and attentiveness can be readily identified. 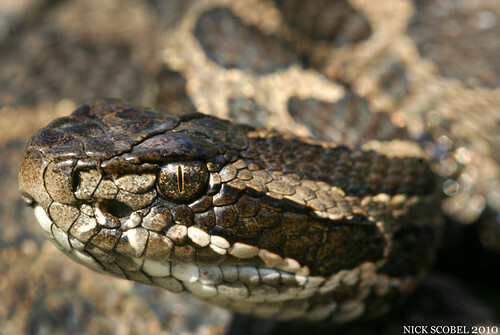 This large juvenile is sporting the textbook "stardust" pattern that is characteristic of this species. Black-bellieds get their name from obviously, their dark colored ventral surface. 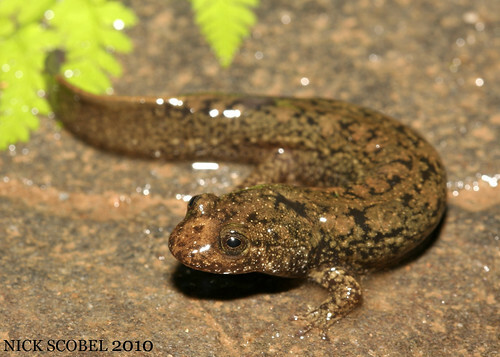 They are considered to be a first and second order stream species and turn up under rocks near thundering stream edges. 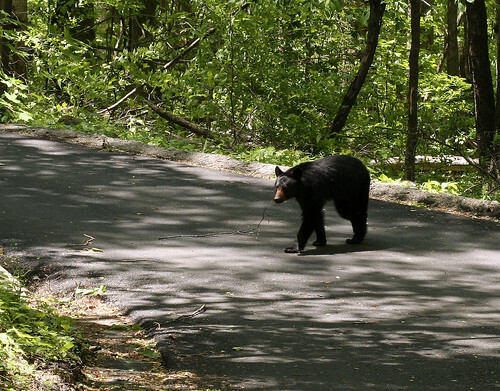 After a long rest at the falls, we headed back towards the trailhead and as we got back to the car, we noticed this American Black Bear crossing the road near our parket lot. The Black Bear is the poster child of the Smokies and they always draw huge crowds of camera happy tourists along the roadways of the park. This is one of ten or more that we saw during out trip. We decided to go grab some lunch and then head back to camp to rest for a bit. Along the way, we came across this well known tunnel along on of the main park roads so I decided to snap a few photographs. As I was photographing the tunnel along the roadway. I noticed a nice seepage along the edge of the road on a hillside and decided to check it out. 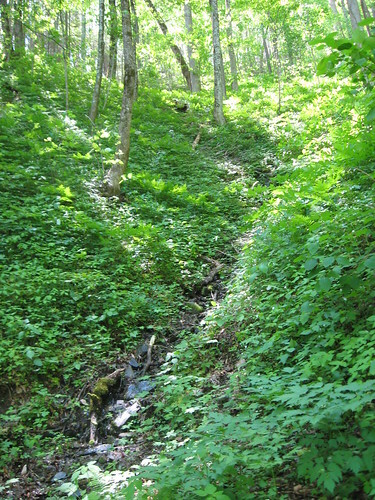 Low elevation seepages such as this one provide ideal habitat for a number of salamander species which include Black-chinned Red Salamanders, Blue-ridge Spring Salamanders, and others. I flipped a few pieces of cover in the seepage and was greeted by a bright red salamander, one of my favorite finds of the trip. This brightly colored salamander is only found in the Great Smoky Mountains and is common at low elevations throughout the park. It prefers seepages and small streams where ample cover is available. 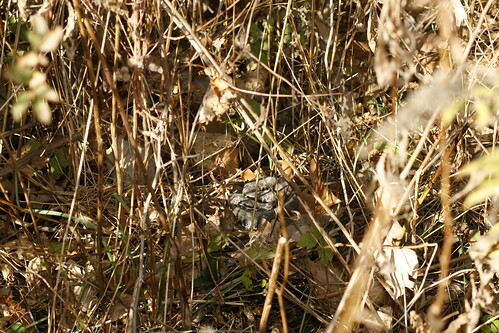 They spend most of their time under logs and leaf litter in search of food. This handsome salamander was a nice bonus to our species total so far. That night, I decided to go do some road cruising to see if there were any snakes out on the move. 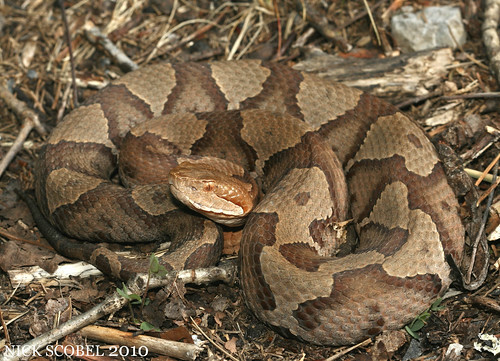 I observed several DORs including a Northern Copperhead, Midland Water Snake, Ringneck Snake, and a Smooth Earth Snake. 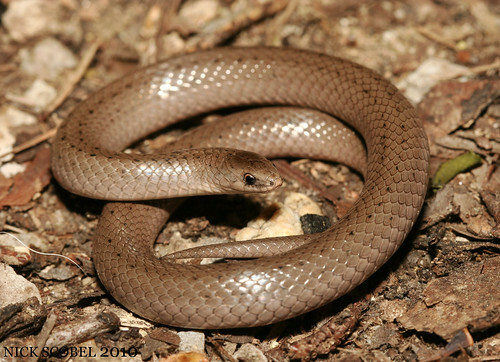 Luckily, I managed to turn up a live Smooth Earth Snake crossing the road. 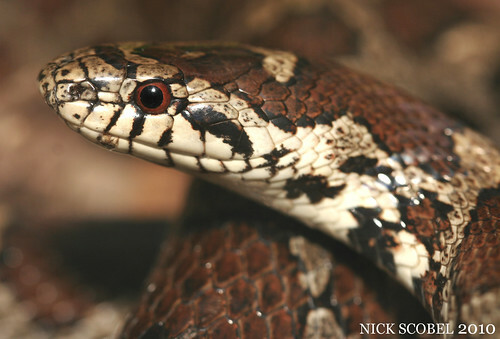 These small, secretive snakes are rarely seen out in the open. They are a fossorial species, meaning they spend a lot of time burrowing underground in search of food and cover. I was extremely fortunate to see one of these out crossing a road at night. 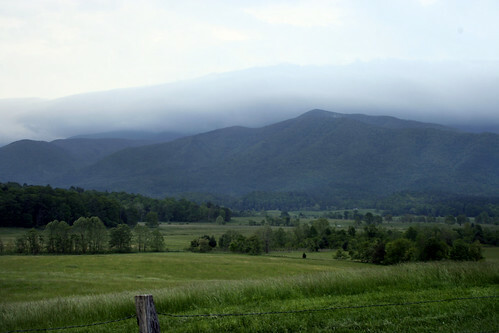 The next morning, I awoke extremely early to go for a drive in Cades Cove to see what kind of wildlife was out at sunrise while my companions slept it. I was greeted with a spectacular morning view of the mountains. After spending some time in the cove. I checked back at camp and alas my companions were still fast asleep, so I decided to go drive a road I had been told was good for Timber Rattlesnakes & Copperheads. 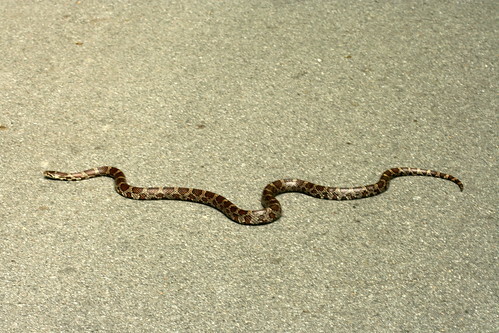 The sun was peaking out and the temps were muggy, so I liked my chances of seeing a snake on the road. After two passes on the road, I looked ahead and saw a large thin snake laid out in the road. I pulled over and jumped out to grab this large Eastern Milk Snake off the road. 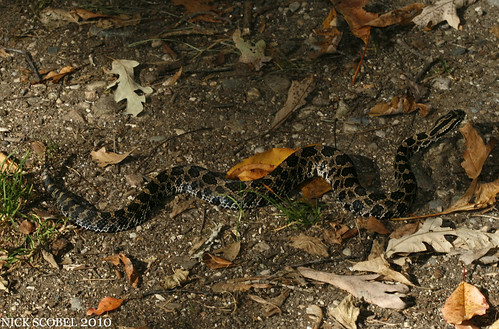 This snake was in excess of three feet in length and dwarfed any other Milk Snakes I had ever seen. I ended up seeing one the next night as well while road cruising, but it got away. This snake was healthy and feisty, which made it a great candidate for a quick photo shoot. 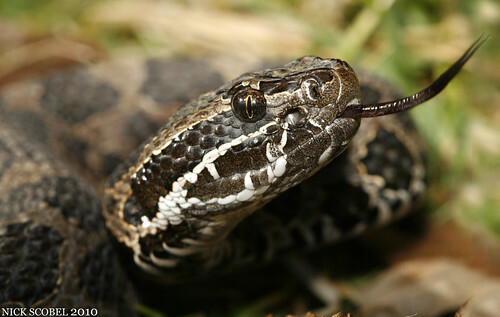 These snakes are constrictors and are excellent conrtollers of rodents. They're usually a feisty snake, and this one was no different as it left me with some nice bites to remember it by. 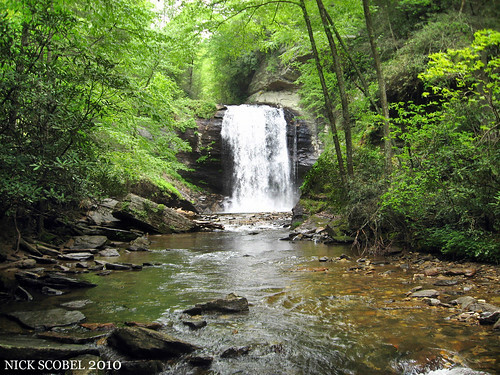 The following day we headed over to North Carolina to check out some waterfalls and check out some mountain streams for a particular amphibian. 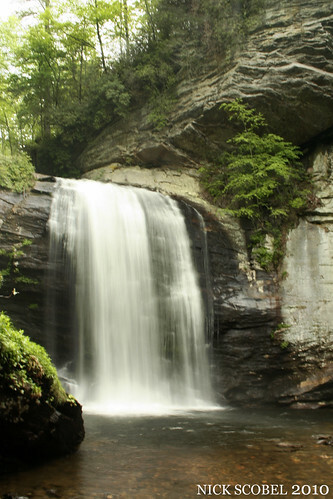 We stopped first at a very popular waterfall called Looking Glass Falls. This large 90 foot waterfall is by far one of the most spectacular falls I've seen, and thats being compared to Niagara Falls & Tahquamenon Falls in Michigan's Upper Peninsula. We spent a good hour at the falls relaxing and taking some photos. 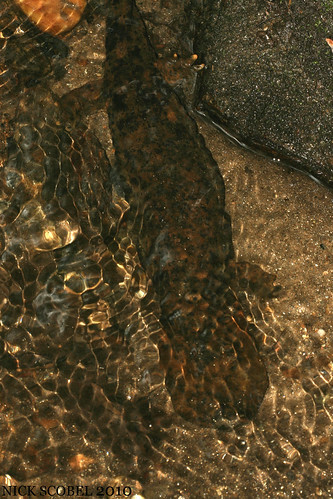 After marveling at the falls, we drove a few hours to a quiet mountain stream that is home to the largest amphibian in North America, the Eastern Hellbender. The stream was quiet, shallow, and crystal clear and was an amazing place to spend the afternoon. I decided to wade into the stream with a few friends that we rendezvoused with at the site and began a slow walk upstream, looking carefully for any movement. Before too long, I noticed a large dark shape moving about in the shallows and began to yell to everyone to come over. Sure enough, there was a Hellbender. 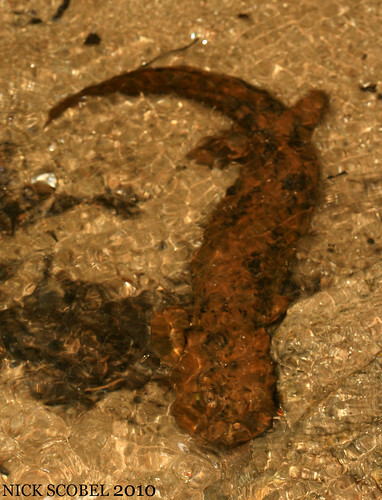 These large aquatic salamanders can grow to almost two feet in length and are the largest salamander in North America, and the third largest in the world. They do have lungs, but most of their breathing is done through gas exchange within the fleshy folds of skin along their sides. 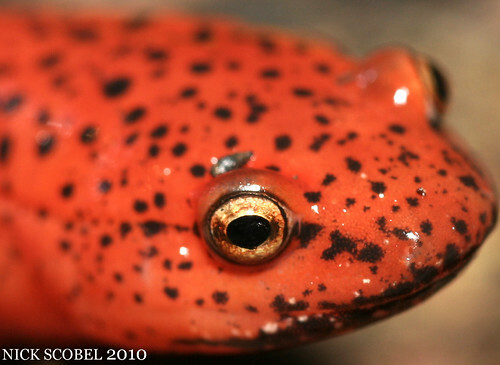 Their genus name Cryptobranchus, is a true and fitting name. Crypto meaning hidden, and branchus meaning lungs, literally means hidden lungs on the side of their body. We ended up seeing 7 Hellbenders in a matter of twenty minutes and decided to call it a day. These were the finds of the trip for me, I had always dreamed of seeing a hellbender in the wild, and on this day that dream came true. We ended up heading home the next day, but it was an amazing trip with two people who are extremely important to me. We all had the chance to see and do something we enjoyed, and I think in the end we all become closer because of it. Until next time, happy herping!